Daniel Radcliffe often worries he's got snot running from his nose before a big event. Daniel Radcliffe often worries he's got snot running from his nose before a big event. The 25-year-old actor is currently promoting his latest film Horns, in which he plays a young man called Ig Perrish who is suspected of murdering his girlfriend Merrin (Juno Temple). Upon waking from a night of drinking, Ig discovers horns growing from his head and soon he finds their presence cause people to confess their sins and give in to selfish impulses. 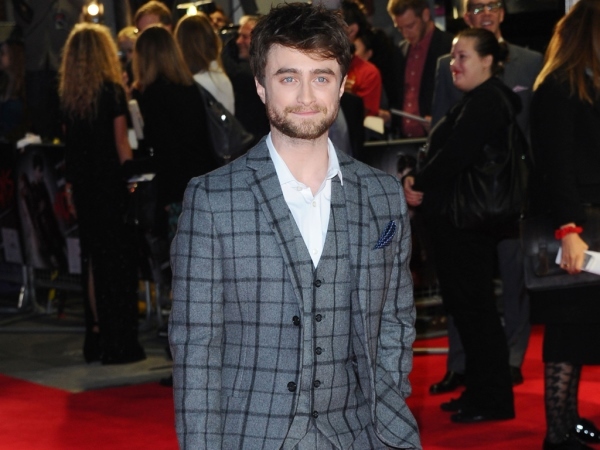 Last night Daniel attended the movie's London premiere and, despite having been in the spotlight since the first Harry Potter film in 2001, he still has fears on the red carpet. "You don't ever get used to getting out of the car and having that wall of sound hit you. Definitely, when I was younger, it used to freak me out. I've got better at it, I think because now I've realised it is a genuine chance to meet people who are fans of yours and the film and of the material," he explained to BBC Radio 1's Nick Grimshaw. "As intense as it is, it's very sincere and genuine, which is lovely. But you are overcome with incredibly mundane fears, magnified in it, so you're like, 'Is there snot coming out of my nose? Are my flies done up?' Those are the thoughts that run through your head when you get into a car. It's not very glamorous." Daniel embraced the quirky film when offered the script, but pondered whether he's weird for dubbing the feature an "obvious yes", despite its odd storyline. He also praised director Alexandre Aja's "awesome mind" and is enjoying hearing people's reactions to Horns. "You do still have that moment [of hating yourself] when watching it; at some points, those moments of self hatred are many. But just 'cause it's, 'Ah my face still looks like my face!'" he laughed. "But it was great, and people seem to really enjoy it and respond to it. It's a crazy movie; it's nuts. It shouldn't be one of those films when people come out going, 'Oh god, I loved that.' It's one of those films that some people come out going, 'What the hell was that?' and other people come out going, 'That's my new favourite film.'" Daniel's string of successful movies has landed him second place in Heat magazine's Richest Under 30 list, with a worth of R1,1 billion (£63,56 million), missing out on first place to One Direction. The band's frontman Harry Styles was recently snapped throwing up in Los Angeles, and Daniel joked he will visit the spot when next in the city. "I'm gonna take flowers, pay homage," he chuckled.